Today I have a little something special I made for you that I thought you may enjoy for your tablescapes this holiday season. 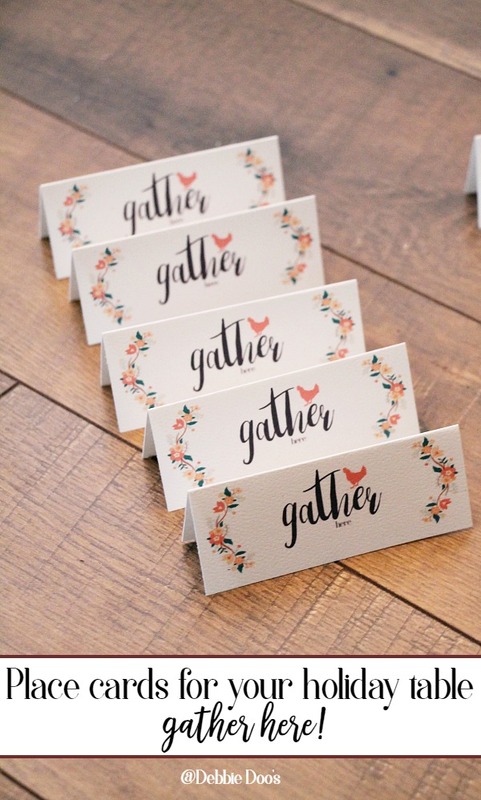 I was on Amazon one day and I noticed in my recommended for you- these place card packs by Avery. I thought to myself, “those would be really cute with my stencils on them”. So of course I ordered the pack and gave it a try. The pack comes with 25 sheets card stock textured white card . Each sheet makes 6 place settings. I went to Avery design center and got busy. I did all the work for you, so all you have to do is print them, and fold them over. Pretty cute huh? I will definitely make more in the future if these go over well. I changed them up a bit for the place card settings. 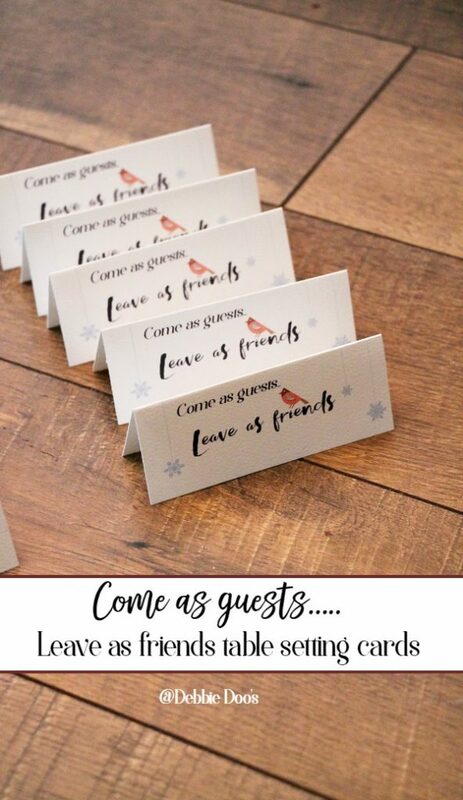 I added a cardinal bird and some snow flakes to the come as guests, leave as friends, and for the gather here I added a bit of a floral border. Hope you enjoy them. These are something you can save for years to come. I think they will make a nice edition to your holiday tables this year. If these go over well, I will make more per season, that way it’s money well spent. 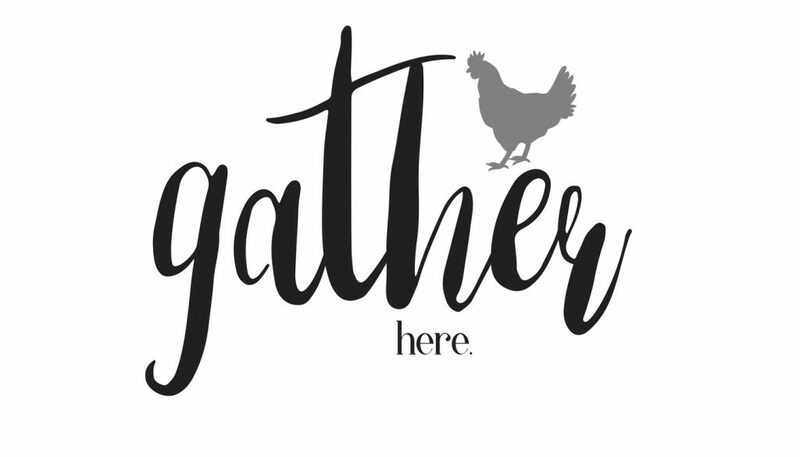 I do the work, you enjoy:) Also, for my readers if there is something specific like for a bridal shower, or birthday party, let me know and I can make you some for your event. Again, all you will need is the paper and I will make them for you. I want to show my appreciate right back atcha! The colors may vary. My ink is running low so they are not as vibrant on mine. 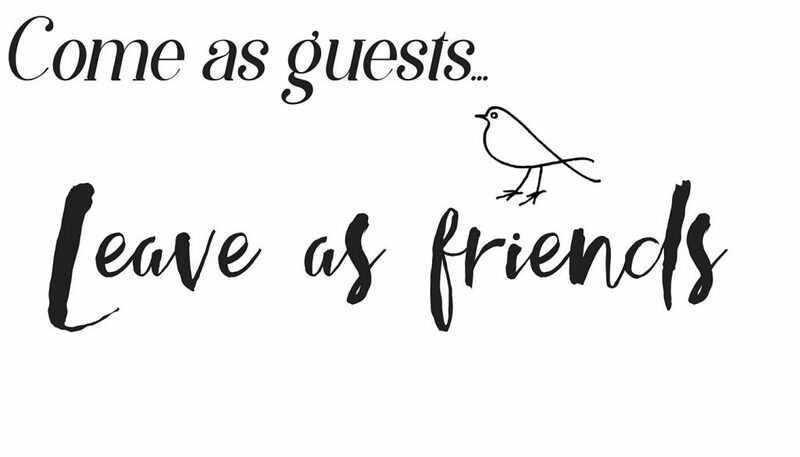 COME AS GUESTS LEAVE AS FRIENDS PDF. Save to your documents or desktop. Then open the document. Place the paper in your printer, and hit print. It’s just that easy. Here is my affiliate link for the Avery place card sheets. When printing please do not use the option print to size. You want to keep the file as is. Love them Debbie!….Have a most wonderful Thanksgiving with your family!! Thank you Shirley! You do the same. Enjoy your holiday! These turned out so well! Thanks Heather, same to you! THANK YOU! 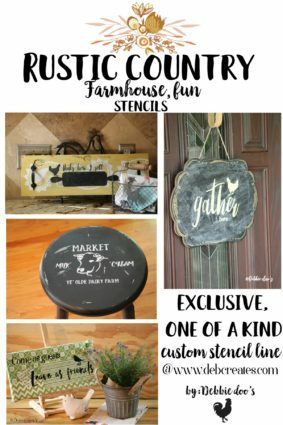 These are beautiful, Debbie, and yes, they will look perfect on my Thanksgiving table, complimenting the barn wood I stenciled. My grand daughters look at that with great admiration constantly, talking about Mimi’s “art project” constantly. You’re a hit with them and with me! Happy, happy Thanksgiving to you and your family! YAY! !~ Judy thank you. Enjoy your family and have fun crafting and creating. 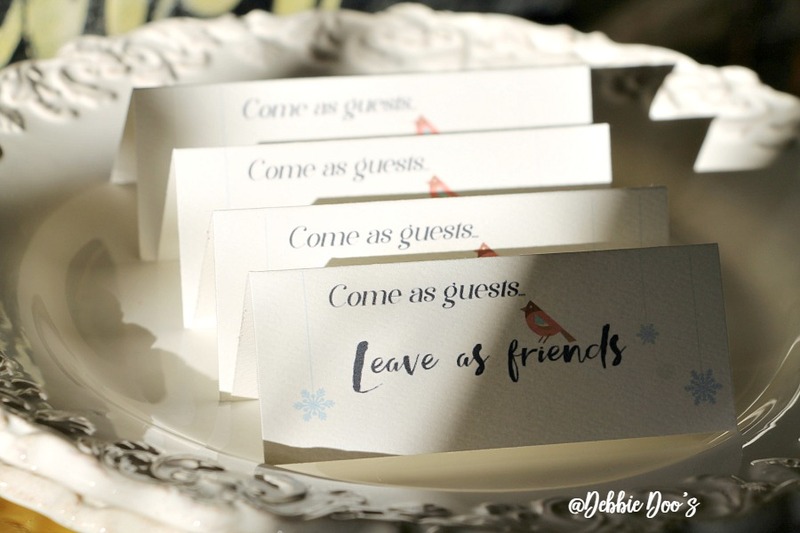 Such cute place cards; very nice Debbie. I’m sure your Thanksgiving table will be wonderful. Wishing you and your family all a Blessed Thanksgiving. Hi, Debbie: I just printed mine to use at Thanksgiving and Christmas. 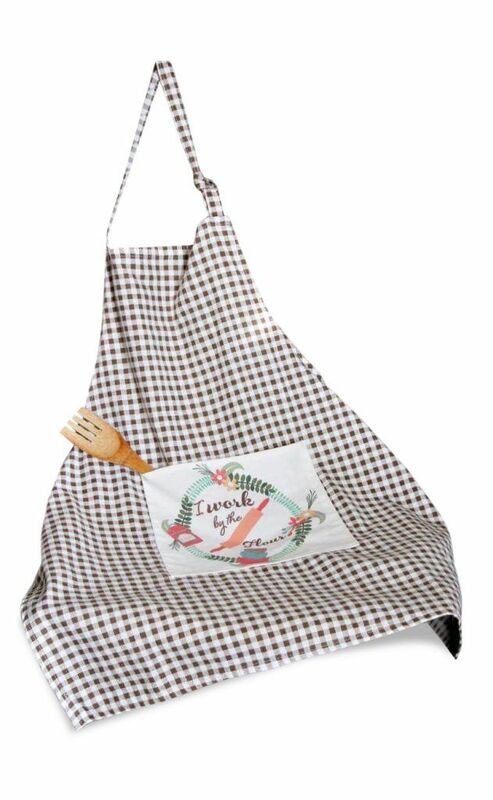 Also, I received my apron and love it. Thank you for all your creativity and especially for sharing it for me to “copy.” I wish for you and your family a blessed Thanksgiving. Thanks Carolyn! So happy you are enjoying everything! Good! You mean downloaded:) They are free for you. These are so pretty! Thanks, Debbie!